Product prices and availability are accurate as of 2019-04-16 04:15:30 EDT and are subject to change. Any price and availability information displayed on http://www.amazon.com/ at the time of purchase will apply to the purchase of this product. 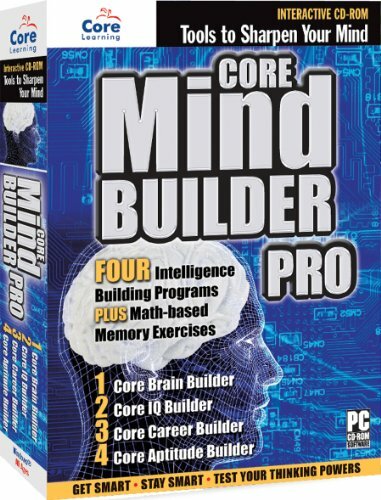 Core Mind Builder PRO offers hundreds of hours of challenging tests which will keep your mind fit and develop basic thinking skills, increase logical and abstract reasoning powers, boost memory and improve problem solving abilities. 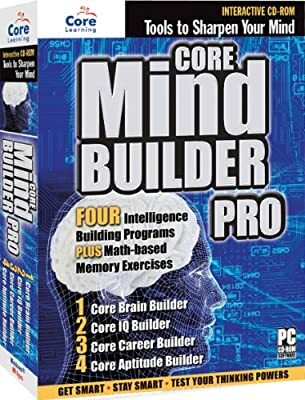 Core Mind Builder Pro contains FOUR brain building software programs (Core Mind Builder, Core IQ Builder, Core Career Builder and Core Aptitude Builder) plus multi-level math-based exercises to boost memory and mental quickness. Derived from brain-based research, the extensive databases of questions designed by top MENSA puzzle editors and test experts can be used both to assess and to develop critical thinking and general intelligence skills as well as practical verbal, math and mechanical skills. Choices are available for test difficulty and controls on test conditions. Use these brain teasers for a pure mental challenge, or more seriously, get prepared for formal entrance tests such as the SAT, LSAT and MCAT. Good brain function requires an efficient working memory to process information and the effective retrieval of learned information from long term memory. 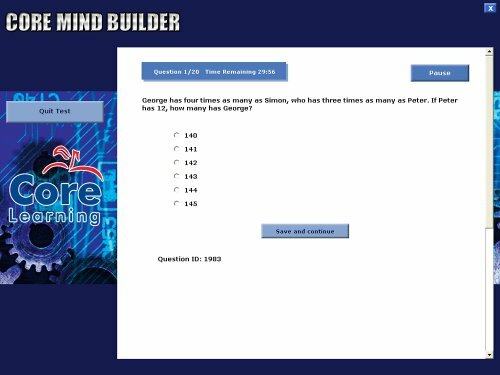 Core Mind Builder Pro includes addition and subtraction exercises that challenge both working memory and long term memory which will not only keep memory function operating efficiently but will also support general mental processing capability. A wide range of skill levels to select from enables an individually suited starting point and an opportunity to progress. Choose Novice, Intermediate or Advanced Level math drills and the number ranges you want to practice with! Track your progress with saved records showing both time and accuracy for your math drills. Core Mind Builder - a great challenge to your logical and abstract reasoning powers; solve a variety of puzzles, conundrums and other tests of your critical thinking skills. 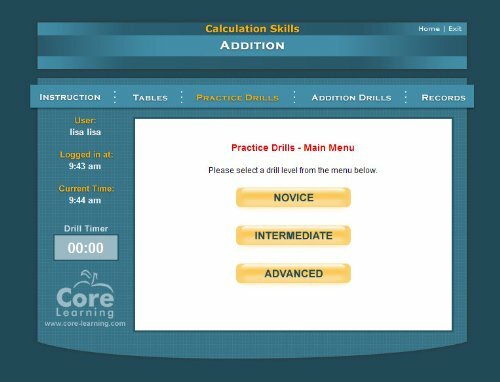 Core Career Builder - a practical test of verbal , math and other skills commonly assessed and valued by employers. 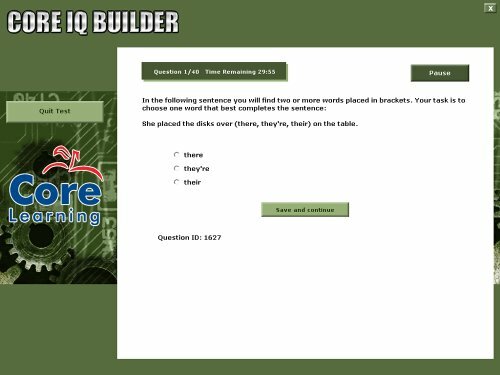 Core IQ Builder - test your general intelligence abilities in ways similar to IQ (Intelligence Quotient) tests. Get your IQ and practice with these tests to broaden your intelligence and improve your IQ test results. 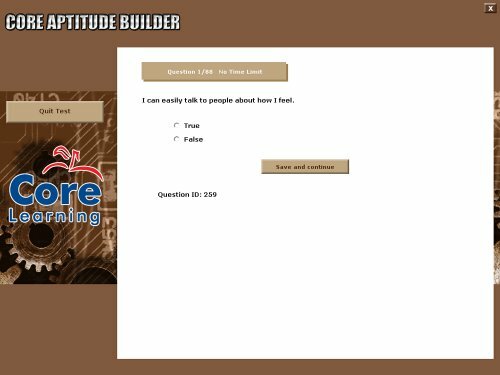 Core Aptitude Builder - explore your personality traits, attitudes and abilities to point you to careers that are best suited for you; includes math, verbal and general intelligence tests. Brain Teasers to help you Get Smart! Stay Smart! and Sharpen your Mind!